Universal Development & Construction (UDC) is pleased to announce two new multi-family communities coming to Sevierville, Tennessee. The Villas at Kyker Ferry will have 268 townhomes and apartments and The Villas at Pigeon River will have 173. Both communities are being jointly developed with Mitch Cox Companies (MCC). Located near the French Broad River between Kyker Ferry Road and the Winfield Dunn Parkway, the Villas at Kyker Ferry will offer one, two and three bedroom townhomes and apartments, many with drive-under garages. 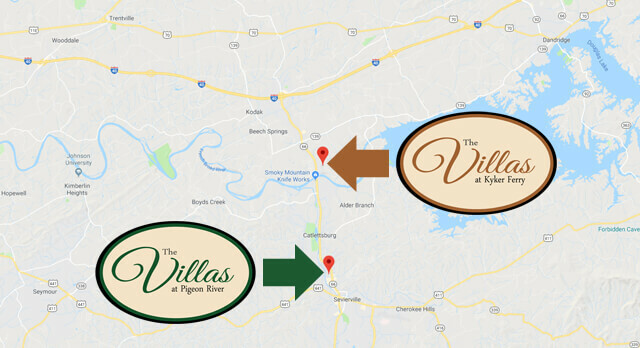 The Villas at Pigeon River will be located between the Little Pigeon River and the Winfield Dunn Parkway near the Sevierville Golf Club and the Wilderness Adventure water park and it too will feature one, two and three bedroom townhomes and apartments. These new Villas communities will be the sixteenth and seventeenth multi-family developments in UDC’s portfolio of over 2000 apartments, townhomes and houses. Rents are expected to start around $769 for a one bedroom apartment and go up to $1,149 for a three bedroom townhome. Grading and site preparation are already underway at both locations and the first units are expected to be available for rent in the spring of 2019. Clubhouse amenities at both locations will include a resort-style saltwater swimming pool, outdoor patio with fireplace, laundry center, business center, coffee bar and a professional-grade fitness center with free weights and cardio machines as well as an outdoor riverside pavilion at The Villas at Pigeon River. The communities will also feature a fenced-in dog park and a children’s playground. Photos of The Villas at River Bend, another community developed by UDC and MCC with similar clubhouse amenities proposed for The Villas at Kyker Ferry and The Villas at Pigeon River. 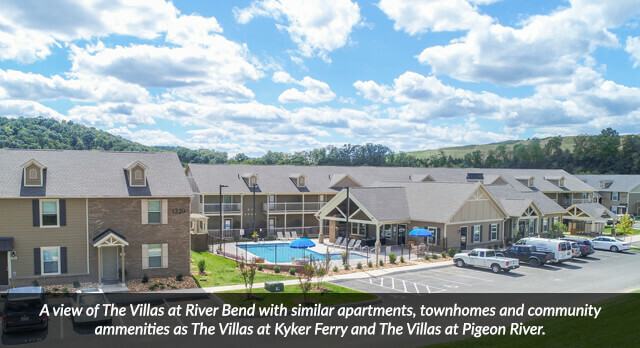 For more information about pre-leasing your new home at The Villas at Kyker Ferry or The Villas at Pigeon River, please call UDC at (423) 282-0640. You can also read about the projects on our website here.